At Asuragen, our strength is our people. That is why we emphasize a positive work-life balance and provide onsite programs that encourage physical activity, nutrition-awareness and tobacco-free living. We are honored that because of these actions we have received the Healthiest Workplace in the small business category, awarded by Austin Mayor Steve Adler and the Mayor’s Health & Fitness Council at a ceremony held September 15, 2017 at Austin City Hall. An award was given to businesses in each of five different size categories (based on the number of employees), and the winners were Humana, Asuragen, Foundation Communities, 3M, and Seton Healthcare Family. 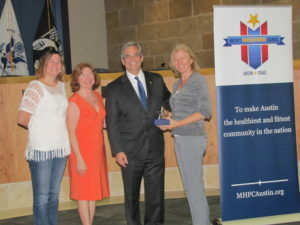 In addition, “for their demonstrated commitment to employee health and well-being,” Asuragen has been certified as an Austin Mayor’s Health and Fitness Council Partner at the silver level. The Partner Certification Program is a mutually beneficial workplace wellness recognition program for Austin-based organizations of all types and sizes. It was created to inspire nutrition, physical activity, tobacco-free living and mother-friendly policies in workplaces. Austin Mayor’s Health and Fitness Council vision for Austin is to be the fittest, healthiest community in America. Its mission is to support and inspire people to improve their health by encouraging physical activity, improved nutrition and tobacco-free living.